The REDARC Group’s Hummingbird Electronics announced on Friday it will establish its NSW operations business hub at the Williamtown Aerospace Centre (WAC) in NSW. Hummingbird Electronics will be located in Building E within the WAC and is due to be completed in June 2017, with occupancy scheduled shortly thereafter. REDARC Group provides a full electronic design and prototyping capability, including electronic product design and manufacture. It also offers fully integrated manufacturing and assembly and whole-of-life support. Engineering services include vehicle battery power management, tracking, sensing and control, health usage monitoring systems (HUMS), management and wiring support. REDARC was named Telstra Australian Business of the Year in 2014. REDARC is ISO9001 and ISO14001 certified and was awarded Deloitte Technology Fast 50 in 2003, 2011, 2012 and 2013. Hummingbird has been a recipient of Hunter Region Business Excellence Awards on several occasions and was purchased by REDARC in early 2015. Director of the WAC James Garvey said the centre is excited to welcome one of the nation's fastest growing technology firms to Williamtown. "We are pleased to welcome REDARC, awarded as one of Australia’s fastest growing firms to Technology Place at the Williamtown Aerospace Centre," Garvey said. "REDARC is implementing serious plans to expand their Defence related business. Coupled with the world leading Nelson Bay-based exporter Hummingbird Electronics, we have one of Australia’s top growing firms moving into the estate. 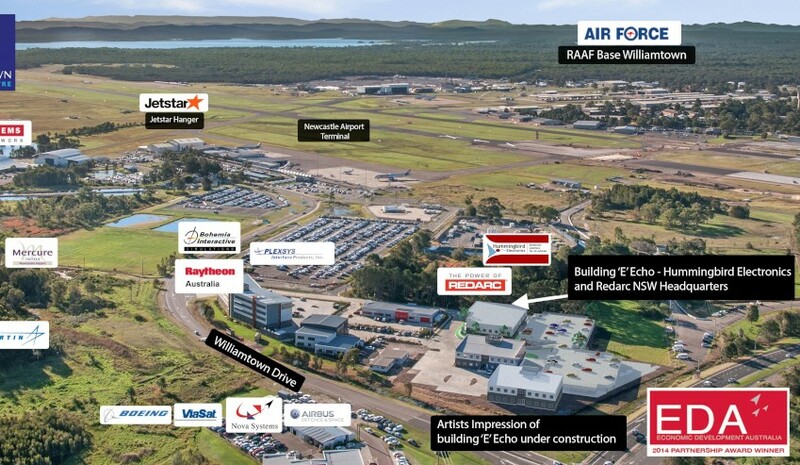 The Williamtown Aerospace Centre is proving itself as Australia’s premier defence technology estate with mature and growing firms like REDARC establishing at the precinct." Managing director and owner of REDARC Group Anthony Kittel said the establishment in NSW is part of their key strategy to grow their defence business. "Establishing our NSW base by relocating Hummingbird Electronics to the Williamtown Aerospace Centre is a key part of our strategy to significantly grow our defence business by 2020," Kittel said. "We are delighted to be located in the defence technology estate along with the high-quality defence businesses currently based in the precinct." The WAC enables organisations to be part of Australia's national and international defence technology capability. Technology Place is currently comprised of three completed buildings, with a fourth building due for occupancy from June 2017. The next building – Building “F” Foxtrot – is currently gaining development approval and is available for lease now with occupancy from 2018. Technology Place is located off the gateway to Newcastle Airport and Williamtown Drive – which enables businesses to be located with other aerospace and air industry companies, and adjacent to Australia’s largest operating Air Force base, RAAF Williamtown, and Newcastle Airport for ease of access from all over Australia.